The thirteenth week of the year was a downer for the market. 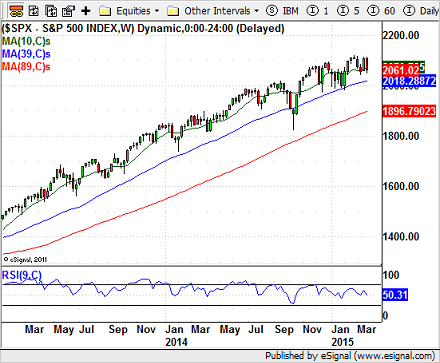 The broader market index, NYSE Composite, and the big-cap S&P 500 declined for the fourth time in the last five weeks. Tech heavy NASDAQ was down for the third times in the past five weeks and the small-cap, Russell 2000, was down only for the second time during this period. For some time, the NYSE Composite has been trying to clear the resistance-zone formed around last June’s high of 11,105. Since making that high, it has knocked on it four times with no success. The narrower index, S&P 500, on the other hand has been on an upward trending slope. 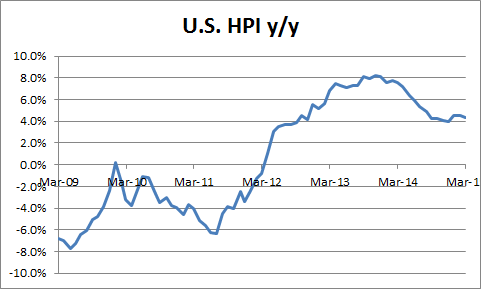 It made an all-time high in late-February but failed this week to go above that level. 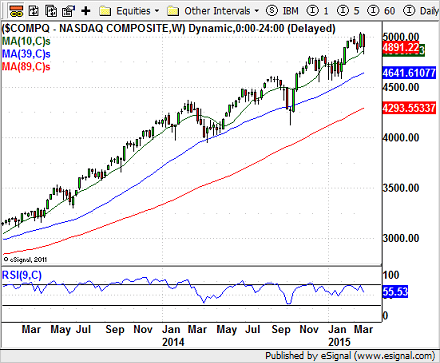 Despite outperforming S&P 500, on weekly basis, in the recent past, NASDAQ’s upward trend is similar to that of S&P 500. It, however, has suffered deeper pullback including this time around last year. 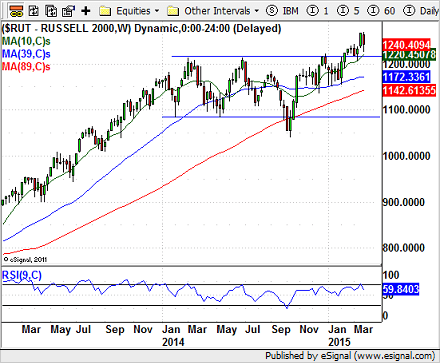 Last year, Russell 2000 did not join the party of bigger cap S&P 500 and NASDAQ. It spent most of 2014 in a horizontal channel. But the index broke out of that channel earlier in 2015 and has so far stayed above. 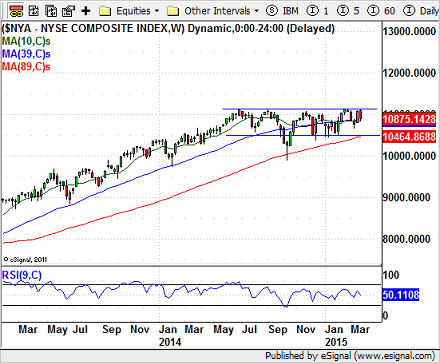 The 2014 underperformance and 2015 out-performance of the Russell 200 compared to S&P 500 and NASDAQ is reflected in NYSE Composite’s horizontal channel at the top. 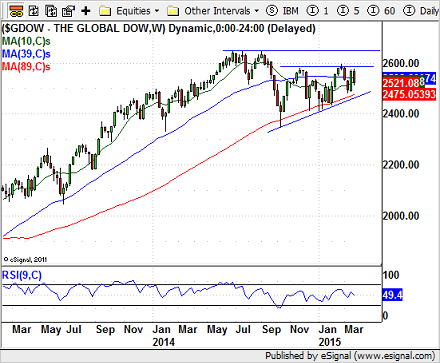 The global stock market, on an aggregate basis, has been underperforming the U.S markets for some time. However, it is forming an ascending triangle and is at the upper limit of the pattern. A break above it would meet a resistance at the all time high formed in mid-2014. Most major indices are at the upper limit of a range and are having many see-saw days and weeks giving the impression that some sort of top is forming or a topple-over is imminent. 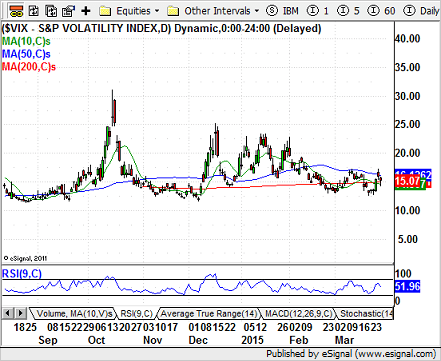 But the market volatility as measured by the S&P Volatility index, $VIX, hasn’t risen much. The daily chart of $VIX shows the index to be at a lower level then what it had reached in October 2014 and then Dec-Feb time period. Perhaps, the last FOMC meeting has calmed the market’s nerves about whether the Fed will act in haste and raise rates or will it still babysit the economic recovery. Generally the data showed an increase from last year’s or month’s level. In some case it was below the estimates of the market economists. 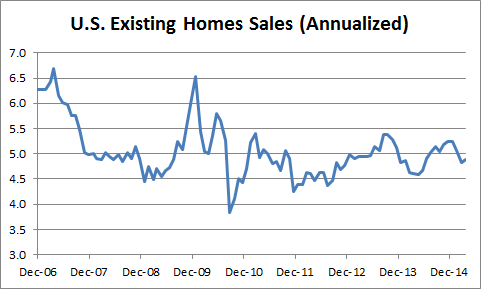 The existing home sales ticked up in February but the rise was less than expectations. The sales are up for the fifth month on year-to-year basis and the prices are up for 36 months. The FHFA (Federal Housing Finance Agency) House Price Index (HPI) was up 0.3% in January, which was below the consensus estimates of 0.5% increase. This is the change in purchase price of homes with mortgage backed by Fannie Mar and Freddie Mac. Later in the week, FHFA said that the based upon several indices of new mortgage contracts, the mortgage interest rates decreased in February compared to January. 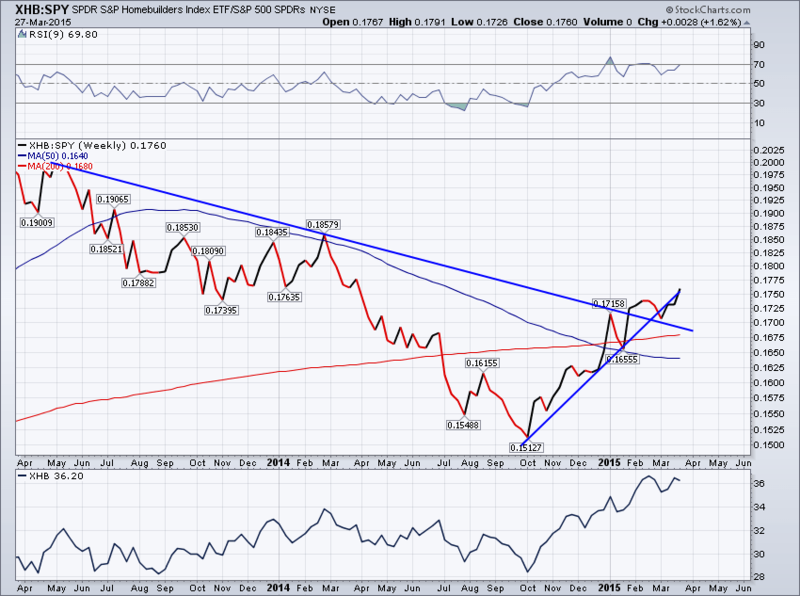 The SPDR S&P Homebuilders ETF, XHB, has been outperforming the SPY since October 2014. 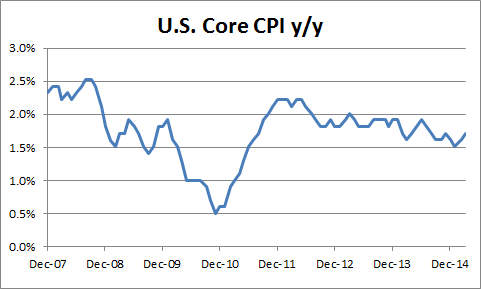 That trend is still in place though seems to be stalling. XHB has broken above the 2014 high and is still staying above it. The major players in this index are Lennar (LEN), Pulte Homes (PHM) and Toll Brothers (TOL). The consumer prices inched up by 0.2% in February in-line with expectations. It broke the streak of three month’s of declining price but the trend is not showing any indication of inflation heating up. 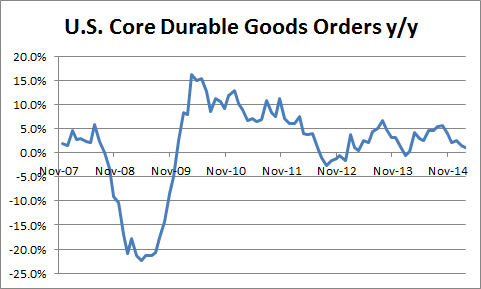 The durable goods orders data is also agrees with that assessment. 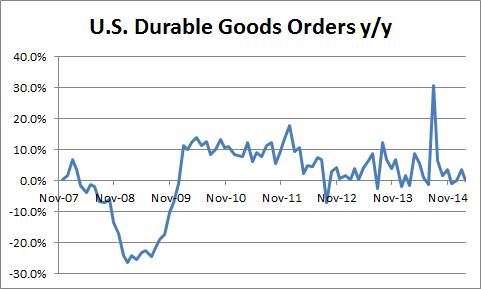 The orders for long-lived capital goods fell 1.4% in February compared to 0.7% rise that the market was expecting. This is the sixth monthly of decline for the index. 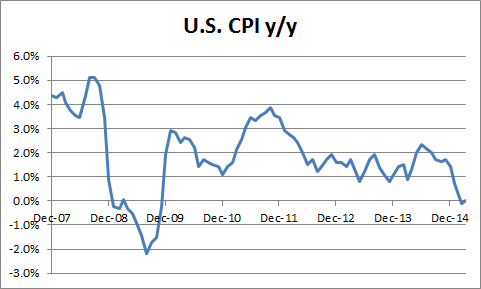 CPI maybe stabilizing but one months data doesn’t make a trend so we need to see more uptick in month-over-month prices. The data so far does not make a case for Fed to hike interest rates soon. We remain in the camp that rate hike probably will not happen in 2015 or at least not till the third quarter.